• A research computing and data center supporting the growing research computing needs of five of the most research-intensive universities in Massachusetts: Boston University, Harvard University, the Massachusetts Institute of Technology, Northeastern University, and the University of Massachusetts. • A historic collaboration among the five MGHPCC universities, state government and private industry – the most significant collaboration among government, industry and public and private universities in the history of the Commonwealth. Among the MGHPCC universities, a research seed program administered by the MGHPCC Consortium, and recently-awarded collaborative research and education grants from the US National Science Foundation and the Massachusetts Life Sciences Center are building a foundation for inter-university collaboration . • A partnership with Holyoke, the Pioneer Valley, and the Commonwealth. 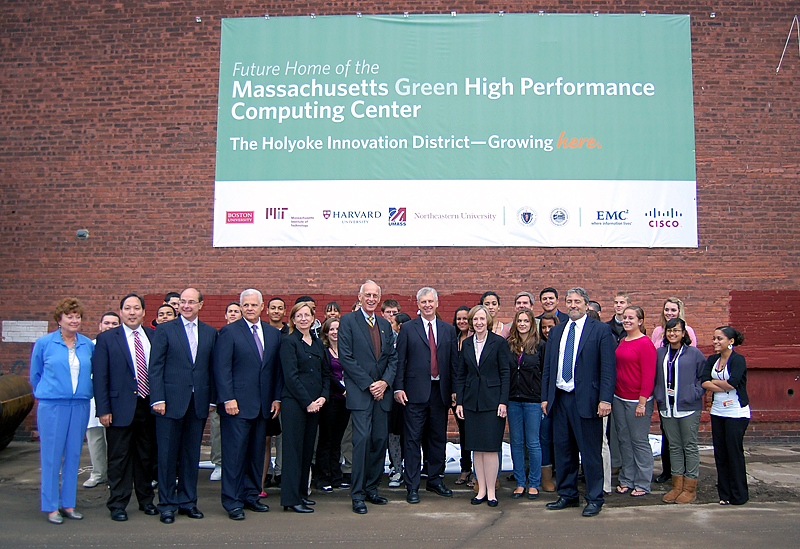 The MGHPCC has worked closely with the Holyoke Innovation District Task Force to leverage the benefits of the MGHPCC facility’s location in Holyoke, and is partnering with K-12 public schools and community colleges on new educational and workforce development initiatives. Explore more about the origins and evolution of the MGHPCC. How Big is the Facility? The facility size is 90, 300 square feet, with 10 Megawatts of power available for computing and another 5MW available for other functions such as cooling and lighting. The site is 8.6 acres, with land and utility power feeds to more than double the capacity of the current facility. The machine room floor has built-out capacity that can house roughly 10,000 high-end computers with hundreds of thousands of processor cores, and expansion capabilities in the building for a further 10,000 computers. Low Cost, Reliable, Green Power & Access to High Bandwidth Communication – The City of Holyoke’s Gas and Electric Department (HG&E) provides low-cost, green power that is both accessible and reliable. More than 70% of the power delivered by HG&E is generated by a local hydroelectric plant. HG&E has also invested in solar energy generation. The close proximity of these sources of power to the MGHPCC facility improves reliability and reduces load on the regional power grid. The Springfield/ Chicopee area lies at the crossroads of national fiber optics networks – a hub of connectivity throughout the northeast and the world. In addition to supporting dedicated links to each of its member institutions (currently 10Gbps, and upgradeable to higher speeds), the MGHPCC houses a Northern Crossroads node that provides high bandwidth connections to dozens of other research institutions and to research networks such as Internet2.